The prospect of a job with Tektronix in Beaverton brought engineer and pioneer winemaker Richard Erath to Oregon in 1968. His father and grandfather were winemakers in Germany. 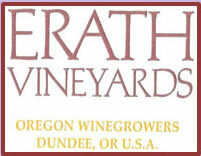 In 1968 Erath bought 49 acres in the Chehalem Mountains & experimented by planting 23 different grape varieties. He bonded Erath Vineyards in 1972 and released his first vintage of 216 cases. In 1975 he partnered with lumber executive Calvert Knudsen creating the Knudsen Erath label. 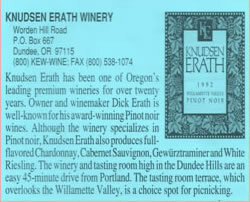 In 1988 Erath bought out Knudsen’s interest and restored the Erath Vineyards label. In 2006 the winery was sold to Washington based Ste. Michelle Wine Estates who continue to operate Erath Winery.